Branding and digital agency AHOY have today announced their expansion into Liverpool’s Commercial District, with offices in the trading rooms of the Grade II-listed Cotton Exchange. The news comes as more and more creative businesses are moving to the District, taking advantage of the Commercial District BID’s continued efforts in developing and improving the area. AHOY’s founder, Mark Stringer, spent three months researching suitable Northern cities that would fit with the agency’s culture and allow them to leverage their food & drink, hospitality and fashion portfolio. Liverpool came out as the obvious choice for the agency, with bonus of Antonio Giansante, one of AHOY’s Account Directors, being from Merseyside. The decision to move into the Cotton Exchange (a Bruntwood property) was based on a mixture of good location, competitive rent, beautiful rooms with parquet flooring, as well as a refurbished historic hall and a large, contemporary roof garden that will serve as networking space. 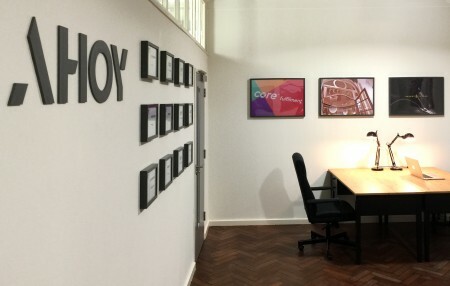 Mark Stringer, Managing Director of AHOY said: “As an agency, we’ve spent a lot of time at Liverpool over the past few months and been warmly welcomed by a host of lovely business people in the process.